Banned From Google Event Markup? Submit A Reevaluation Request. Home > Google News > Google SEO > Banned From Google Event Markup? You Can Now Submit A Reevaluation Request. 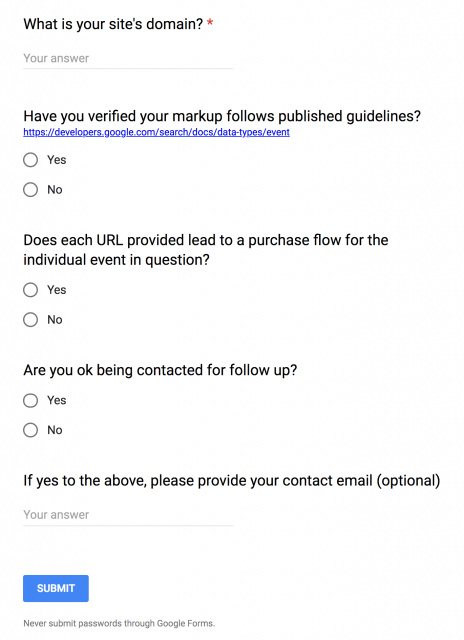 Google has added to their event markup documentation the ability for publishers to submit a reevaluation request if your site was banned from using event markup in the past. Aaron Bradley spotted this and posted about it on Google+. I hope you never need to use it but it is there if you need it.